The Peel P50 is a three-wheeled microcar manufactured in 1962 and 1965 by the Peel Engineering Company on the Isle of Man. 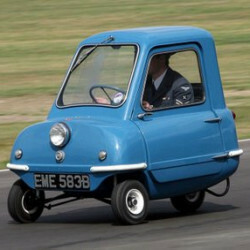 It retailed for £199 when new, and currently holds the record for the smallest-ever automobile to go into production. Designed as a city car, it was advertised as capable of seating "one adult and a shopping bag." The vehicle's only door was on its left side, and equipment included a single windscreen wiper and only one headlight. Standard colors were Daytona White, Dragon Red and Dark Blue. At 54 inches long and 41 inches wide and with an unladen weight of 130 pounds, the P50 holds the record as the smallest ever to go into production. The P50 used a 49 cc engine which gave it a top speed of approximately 38 mph, and was equipped with a three-speed manual transmission that had no reverse gear. Consequently, turning in a confined area could only be achieved by pushing, or lifting the car using the handle on the rear and physically pulling it round. The makers and users claim 83 mpg-US. 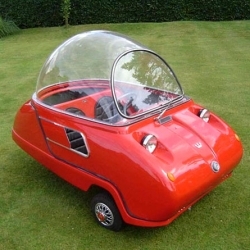 At least one prototype, the Peel P55 Saloon Scooter, has also survived. Unlike the production Peel P50 (along with all developments and replicas thereof), this prototype used the less stable layout of a single wheel at the front and two at the back. 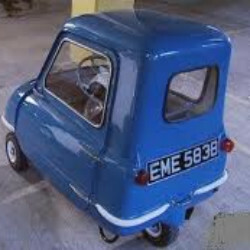 Approximately 50 Peel P50s were sold at £199 each.